You guyssss! I have been a fish-cooking failure for YEARS. I would get all, “We need to eat more fish around here!” and then I would make terrible, sad fish (I mean, once it managed to be both dry and mushy?! #how), and feel like I wasted all the dollars, and be afraid to try again for a long time. 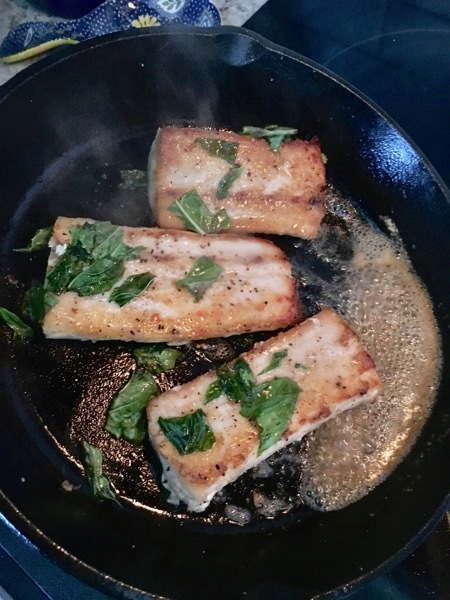 But I’ve been making this pan-seared fish with lime and basil for the last few months and it’s one of the fastest things I make, AND ALL MY KIDS LIKE IT. (They ask for seconds!! I think the only other protein my people ask for seconds of is hotdogs…and, I’m sorry, but you’re 3 and I’m cutting you off at one hotdog. But you can have as much fish as you want!) So in a way, it feels miraculous, but it’s also tender and flaky fish with a crispy top and little puddles of melted, nutty butter with tangy lime and basil, so maybe that’s not really such a surprise after all. I get frozen mahi-mahi fillets from Costco in a big bag. They’re individually packaged, about 4 oz each, and they thaw REALLY fast in a bowl of warm water in the sink. Like, in 10-15 minutes. The other day I realized at 5:00 that we needed dinner, and we went from frozen fish to dinner on the table at 5:30. If that’s not faster-than-fast-food, I don’t know what is! (Important notes: Jay and I were both home and got the food ready together, and the girls were watching TV. But still.) You could definitely use fresh fish, too! 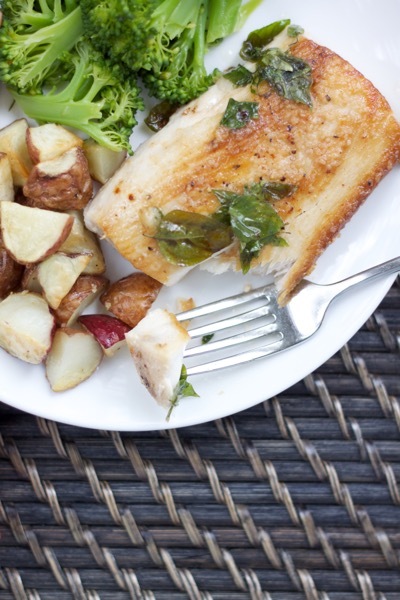 We’ve made this recipe with fresh grouper fillets and it was fantastic. A cast iron skillet is really wonderful here to get that browned crust on the fish. I have the 10-inch and 12-inch Lodge cast iron skillets and I adore them. I think you need at least one in your life. If you’re adamantly opposed, just use a good, heavy-bottomed skillet. I wouldn’t use nonstick here because usually nonstick pans shouldn’t be used with high heat, which is important in this recipe. So: get a big pat of butter, cut a lime in half, and get a little pile of basil leaves. Pat the fish dry with paper towels and sprinkle it with kosher salt and pepper. The fish cooks SO fast, and you can’t be running to the fridge to grab the butter or slice a lime. It needs to be all ready right there beside you so you can work fast. I like to get my pan heating up on medium-low while I do the prep, so it’s getting nice and evenly hot. When you’re almost ready to cook, increase the heat to high. Add the oil and then place the fish gently into the pan and lower the heat to medium after about 30 seconds. The key is to let the fish cook undisturbed for a couple of minutes to get nicely browned. When you flip the fish, that’s when things get exciting. You’ll drop in the basil and the butter. The butter is going to melt super fast and maybe start to brown. 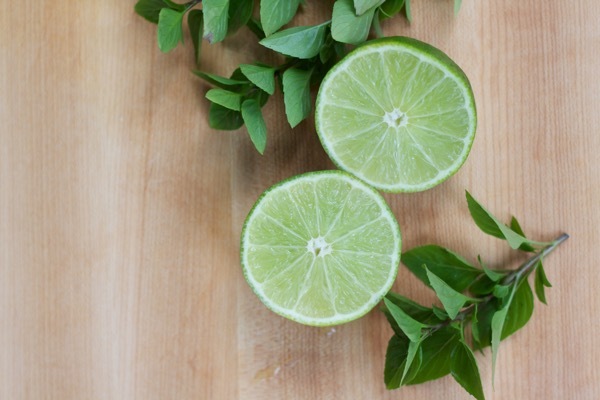 You don’t want it to burn, so have your lime ready to squeeze in once it’s melted. Carefully tilt the pan and get your chef on: use a spoon to baste the fish with the melted butter while it finishes cooking. Depending on the thickness of the fish, it will need to cook for another minute or two while you baste. 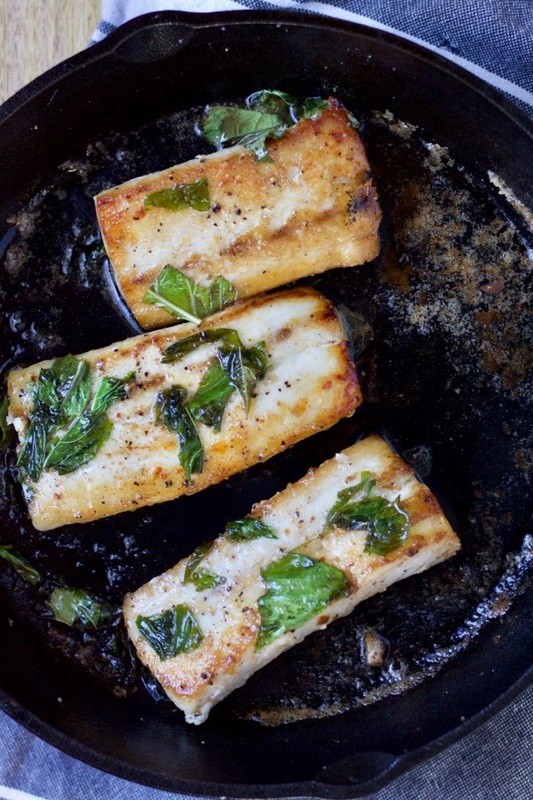 And then…then…you have this amazing, toasty brown, buttery-lime-y, tender pan-seared fish with crispy bits of basil. It’s just SO GOOD. Begin heating a 12-inch cast iron skillet (or other large heavy skillet) over medium-low heat while you prep the fish. Pat the fillets dry with paper towels and sprinkle with salt and pepper on both sides. Have the other ingredients ready to go: lime sliced, butter unwrapped, basil rinsed and torn. Increase the heat to high and let it get hot (at least a minute), then add the oil. Carefully swirl to coat the pan, then gently add the fish, laying them down away from you so you don’t get splashed. (I cook what I think of as the “top” first, but I really don’t know what the “top” is or if there is one…?!) Cook for 30 seconds on high, then reduce heat to medium and cook (resist the urge to move it around – let it sear!) for 2-3 minutes, until nicely browned. Flip the fillets and add the basil leaves and 2 Tablespoons of the butter (if the pan seems too dry while you’re basting, add the remaining pat, but you probably won’t need it). The butter will melt fast. Once it’s melted (it may begin to brown and smell nutty; this is a Good Thing), squeeze in the lime and tilt the pan to let the butter pool on one side. Use a spoon to baste the fish as it continues to cook. It will take 1-2 minutes more, depending on how thick the fillets are. When the fish is done it will flake/pull apart when you cut into it with a fork. I mostly go by the times on this recipe, and it’s actually very forgiving if you overcook it slightly because the butter keeps things moist! 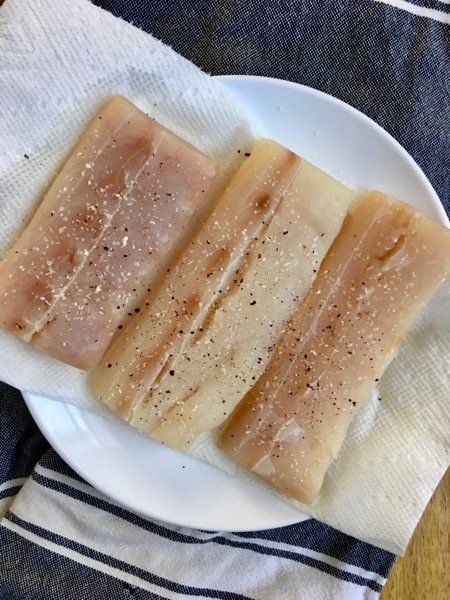 This recipe is pretty flexible – you can use any fish you like (I have used mahi-mahi and grouper), sub in any fresh herbs, use lemon in place of lime – we had it with lemon and cilantro recently and it was great! We love this recipe! It’s an easy and incredibly delicious way to prepare fish. 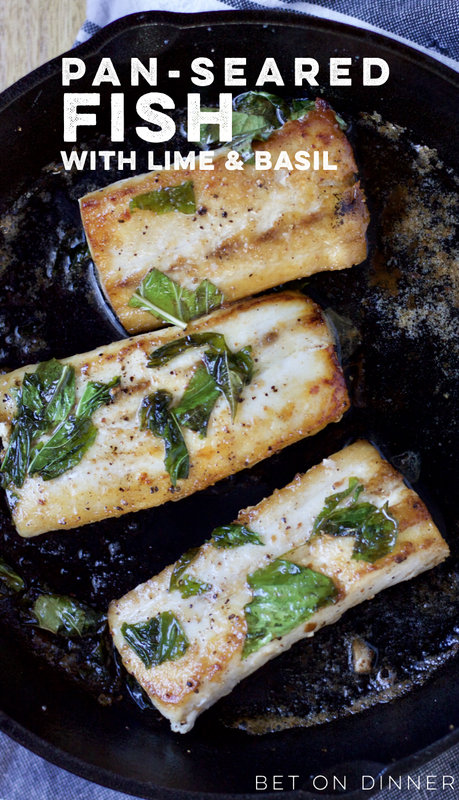 We’ve used Mahi, Wahoo and Black Sea Bass, but it should work well with any white fish. It’s also a great way to make fish for fish tacos. Thanks, Bet! Woohooo! I’m so glad y’all are enjoying it. I’m going to have to try the fish taco idea – love it! This fish has become one of our go-to dinners. So great to go from frozen to in your belly in 20 minutes—and everyone likes it! It has boosted my confidence enough to branch out to some other fish recipes. Although it’s also the standard by which other fish recipes are measure… and found lacking.